Ryan Gosling's Decade-Long Love of Steve Carell Pays Off With "Stupid Crazy Love"
Ryan Gosling is one of the hottest dramatic actors in Hollywood, having given remarkably intense performances as a junkie middle-school teacher in "Half Nelson," a man in love with an inflatable doll in "Lars and the Real Girl" and a man whose marriage is collapsing in "Blue Valentine." But he's never tackled a comedic role before—so what the hell is he doing playing a ladies' man in Steve Carell's new romcom, "Stupid Crazy Love"? 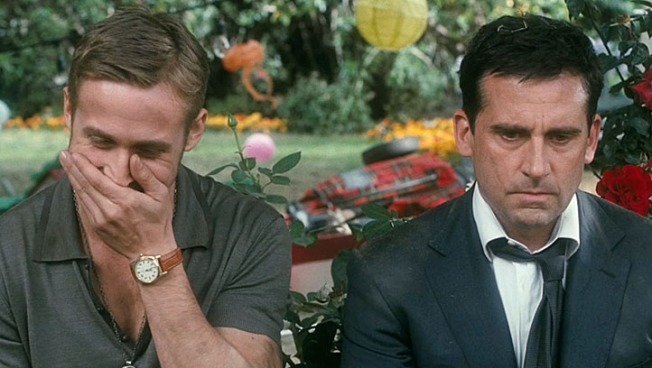 "I did it 'cuz I love Steve Carell, I just love him," Gosling told PopcornBiz. "I think he's the best. When I first moved to Los Angeles, I did a pilot and I was 17, I had a small part, so did Steve. He was so funny that I would go to set to watch him work. "One time he was so funny the boom guy had to throw down his mic and have a laugh attack in the corner. I'd never seen anyone that was so good that it was a problem. So I just became and huge fan, I began watching him on "The Daily Show," I watched all his movies, I even liked him that movie 'Over the Hedge'," where he plays a squirrel that loves energy drinks. 'When I heard there was a film with a part that I could have, I just wanted it. I would've done anything, really. I just got lucky that it was such a good role and great directors and a good cast." Emma Stone chats about improvising with co-star Ryan Gosling for their intimate bedroom scene, but what footage was she sad to see left on the cutting room floor? So as Gosling's respect for Carell blossomed across more than a decade, one might wonder if Carell had, in turn, been keeping tabs on Gosling. "No. When I went in for the meeting with him, I thought I had it in the bag, 'cuz we had worked together. But he didn’t remember." Talking to Carell about their first meeting for "CSL," the funnyman doesn’t even mention their past work together. 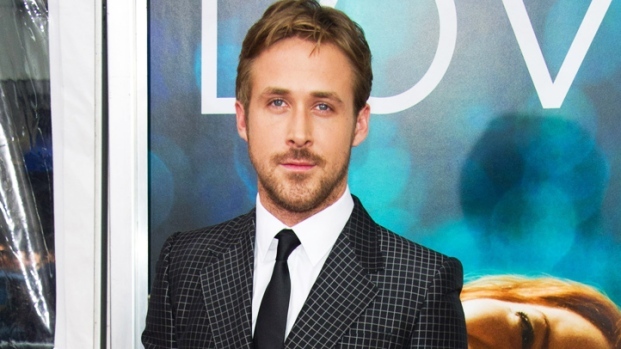 Ryan Gosling chats about taking on a comedic role in his new movie, "Crazy, Stupid, Love." What did he think about working alongside Steve Carell? Plus, were his abs digitally enhanced in the movie or is that all him? "I met with him, and I thought we'd have a half-an-hour meeting and just talk and get to know each other a little bit. Three hours later, we were still talking and I thought he was a wonderful guy," says Carell. "And he's not known for his comedy, but he's hysterically funny. He's very good at it, kind of a natural." Carell, who also worked as a producer on the film and so played a larger than normal role in casting his co-stars, says he was sold on Gosling when he realized they shared a similar philosophy on comedy, if not experience. "We talked during that meeting about his approach to comedy. What he would want to do with this part, and I thought he was exactly right. He didn’t want to tell jokes, he didn’t want to try to be funny. He just wanted the character to be such that you would follow along with him, you'd laugh with him…like any other character you'd play. We agreed that, something very specific for me in a comedy, is that the characters don’t know that they're in a comedy, they're not acting like they're in a comedy, they're just in life." "Crazy Stupid Love" opens Friday, July 29.